Find out how Mytek’s latest reference‑level converter stacks up against the competition. Until very recently there were essentially three different D‑A converters (DACs) in Mytek’s range, spanning a very wide price bracket. Their flagship Manhattan DAC II model is priced at around €$5995, their mid‑range Brooklyn DAC+ at €$2195, and the Clef mobile DAC/headphone amp at €$299. Reviewed here is the latest member of the family, the Liberty DAC (as you might already have surmised, Mytek’s product names tend to reflect the company’s home city of New York), and this new model fits in between the Brooklyn and Clef units, with the asking price being a shade under $€1000. In some ways the Liberty DAC is a scaled‑down Brooklyn DAC+, not only because it’s physically smaller and lighter, but also because of its reduced array of input and output options, simpler feature set, and slightly lower technical specifications. Nevertheless, the Liberty is undoubtedly a high‑end converter and a powerful headphone amp, and it retains many interesting, attractive and unusual facilities. Styled as a one‑third rack‑width ‘brick’, the Liberty’s all‑black case measures just 140 x 44 x 206 mm and the device weighs only 1kg. Another unusual feature is that the Liberty can be battery‑powered, if desired, via a 12V DC coaxial power inlet alongside its rear‑panel IEC socket (which accepts any voltage between 100‑240 Volts AC). So it’s both portable and compact. The case lid features a grid of cooling holes arranged to form the Mytek M logo, which I found quite an attractive feature. 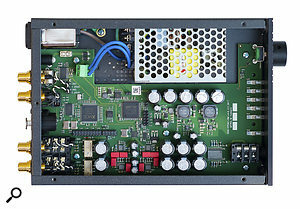 The Liberty caters for USB, AES3 and S/PDIF digital inputs, and sports dual analogue line‑level outputs on balanced jacks and unbalanced RCA phono connectors.Every part of the rear panel carries connectors of one form or another, starting with that IEC mains inlet. Unusually, there’s no mains isolation switch so the unit is either operating or in a standby condition. Next up are three S/PDIF digital audio inputs connected via two RCA phono (coaxial) sockets and a JIS F05 TOSlink (optical) socket. There’s also an XLR input for an AES3 signal, as well as a B‑type USB 2.0 socket. The S/PDIF and AES3 inputs support 24‑bit PCM at all the usual sample rates up to 192kHz, and they will also accept DSD64 datastreams in the DOP format. The high‑speed USB 2.0 interface can expand that range of connectivity by accommodating PCM formats up to 32‑bit and 384kHz, as well as the DSD256 format. Analogue outputs are provided simultaneously on both unbalanced RCA phono connectors and balanced quarter‑inch TRS sockets, the latter being 6dB louder than the former. Moving around to the front panel, a quarter‑inch stereo headphone socket and a black rotary encoder/button sit on opposite sides, with an array of six multi‑colour, multi‑function LEDs in between. The unit is switched in or out of standby mode by pressing and holding the encoder knob for a few seconds, and plugging in headphones does not mute the rear‑panel outputs. The LEDs indicate the operating status, selected input source, and volume setting. To change the input source the encoder knob is pressed briefly and repeatedly to cycle around the options (USB, AES3, S/PDIF 1, 2, and optical), with one of the five LEDs on the right of the array illuminating to indicate the current source. The slightly separated left‑most LED changes colour to indicate the digital signal format being received (orange for PCM, white for DSD, green for MQA and blue for fully Authenticated MQA — see the 'MQA' box for more about that). The Liberty’s intelligent converter system automatically detects and decodes the various input formats, handling a playlist of mixed PCM sample rates, DSD and MQA files or sources completely seamlessly. This LED is also illuminated when the unit is in standby, its colour being user configurable, as I’ll explain in a moment. If the encoder knob is rotated to change the output volume (affecting both the headphone and line outputs simultaneously), the five right‑hand LEDs light to form a static bar‑graph indicating the volume setting. As the volume is advanced, the left LED initially lights blue, then green, yellow, orange and red as the output level is increased, after which the adjacent LED goes through the same sequence, and so on, until all five LEDs are red at the maximum volume setting. This description probably sounds more complicated than it really is in practice; I found operating the unit very straightforward and logical. As is the norm these days, the USB audio interface is class‑compliant for Mac OS X (10.8+), but an ASIO/WASAPI driver (with native DSD support) is required for Windows (versions 7 and higher). This driver can be downloaded from the Mytek web site, along with an optional Control Panel app, which runs on both Mac and Windows, to access a variety of configuration options. Once installed, and with the Liberty DAC connected over USB, the app automatically retrieves and displays the serial number and firmware revision, as well as the current buffer size and the unit’s current configuration. Firmware can also be updated using the app; I upgraded the review model from v1.10 to v1.20, which introduced some additional configuration features. The first two of a row of buttons along the bottom of the Control Panel window allow the input source and volume to be altered remotely, if required, but most access customisation functions such as setting the colour of the standby and source‑select LEDs (16 different hues are available). Other options adjust the brightness of all indicator LEDs, and whether they all turn off after a period of inactivity. The volume control function can also be ‘bypassed’ (disabled) so that the unit provides a fixed full‑level output, and there is a ‘Trim’ facility that introduces a fixed offset reducing the output level in 1dB increments down to ‑12dB — that’s a useful feature for optimising the unit’s output level to match the sensitivity of a power amp, for example. One interesting feature found in Mytek’s Brooklyn and Manhattan converters is the user selection of different reconstruction filter options (steep, gentle, minimum phase, etc. ), and I was expecting to see some options like this in the Liberty’s Control Panel app, too, but sadly not — at least, not in the current release version at the time of writing. Inside the box: high‑quality components and excellent construction standards. The markings on all the analogue audio chips have been sanded away!The Liberty’s main volume and level trim functions are all performed digitally within the D‑A converter chip itself, which is an ESS Sabre ES9018. This is an eight‑channel D‑A chip which is configured as four D‑As per channel coupled in a parallel‑balanced arrangement to maximise dynamic range. This is a common technique and is employed in other Mytek converters, albeit with different physical Sabre D‑A devices (the Brooklyn DAC+ uses the ES9028PRO, while the Manhattan DAC II uses the ES9038PRO converter). Although informative and easy to read, the user manual is fairly light on the core technical specifications, but I measured a maximum signal level from the balanced analogue outputs at +16dBu for 0dBFS digital input, and +10dBu (+8dBV) at the unbalanced outputs. For professional studio use, the maximum level at the balanced outputs falls 2dB short of the standard EBU alignment, and 8dB below the SMPTE alignment but, if used as part of a monitoring chain to feed powered monitors, I doubt this will cause any practical issues. Crosstalk was slightly different between channels, but the worst case I measured with an Audio Precision test set was ‑103dB at 10kHz from a ‑20dBFS test signal, which is very good. Similarly, the THD+N figure was 0.003 percent (for a ‑20dBFS input), reducing to just 0.0006 percent with a 0dBFS input. Measuring the distortion content on its own (without the noise component) gave an excellent figure of 0.0007 percent (ref ‑20dBFS), and all distortion harmonics were comfortably below ‑115dBu at the output. An unusually clean and smooth noise floor completely devoid of mains‑related spikes or artifacts, and no sign of any digital ‘hash’ either. The frequency response chart revealed the ‑1dB points at 9.5Hz and 20.7kHz for a 44.1kHz input signal, while the quiescent noise floor measured ‑85dBu (20Hz‑20kHz bandwidth). An FFT analyser revealed that the noise floor falls gently from just under ‑120dBu at low frequencies, approaching ‑140dBu above 2kHz. Given the fact that the volume control is performed digitally, it’s not surprising that the noise floor doesn’t vary with volume settings and, best of all, there are no visible mains‑related spikes or artifacts at all — evidence of a very good switch‑mode power supply module and a good PCB layout. Comparing the Liberty’s AES17 dynamic range measurement of 112.5dBA against my spreadsheet of other reviewed converters, it matches the measured performance of the Lindell DACX, the (obsolete) Grace Design m902, and the Ferrofish A16 MkII. The only other converter I’ve tested with an ESS Sabre chip is the Benchmark DAC2 HGC, and that scored an AES17 result of a whopping 125dBA — one of the highest dynamic range measurements I’ve captured to date. Nevertheless, a dynamic range figure of 112.5dBA is undeniably a very respectable level of performance — I’m very happy to use my Grace m902 as both a headphone amp and monitor controller on a regular basis, and would be similarly pleased to use the Mytek Liberty. 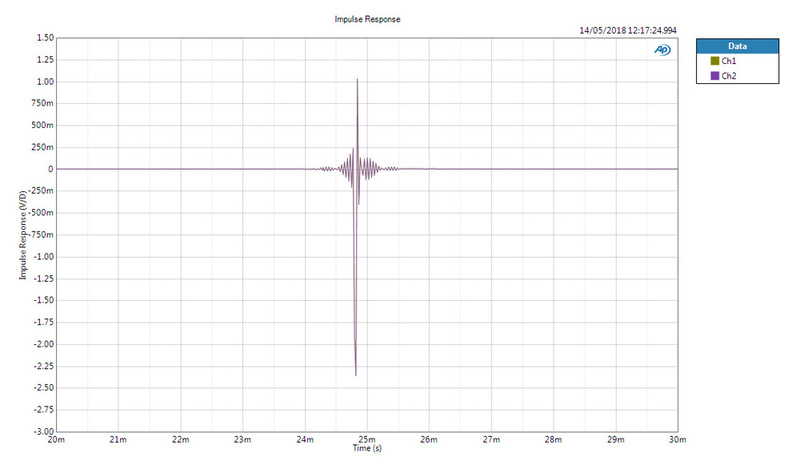 An impulse response measurement showing a short symmetrical (ie. linear‑phase filter) response, but with the leading edge of the impulse going negative, rather than positive, indicating a polarity inversion. I also noticed during the bench tests that the signal polarity is inverted at both the balanced and unbalanced outputs, which is unusual (most signal processors maintain correct polarity between the inputs and outputs). While it’s unlikely to affect most users it’s worth being aware of, since inverted absolute polarity can have an audible effect in some situations (and a few people claim to be sensitive to absolute polarity, anyway). Of course, while test‑bench measurements are useful for confirming and comparing performance at a technical level, they certainly don’t tell the whole story. The design of a converter is highly nuanced and lots of elements contribute to the overall sound quality, including the power supply, the input data recovery and clocking, the analogue and digital grounding arrangements, the analogue output stages, and so on. It is the sum of these parts working together that determines the end result, and in my listening tests that result is very fine indeed: the Liberty is a very classy and detailed converter. I started by patching the Liberty into my Crookwood mastering console in place of its own source monitoring D‑A. Once I’d adjusted for its slightly lower output level I used it over several days and found it to be extremely neutral, transparent, and detailed, with very good portrayal of micro‑dynamics and a wide, expansive sound stage. Later, I used it to convert the output from a Sonos Connect in a domestic hi‑fi situation and enjoyed listening to it greatly. I was glad of the Control Panel app option to dim the LEDs, as I found the factory default settings rather bright, and I later engaged the auto‑off mode so that they all extinguish after a few seconds of inactivity. As the Liberty will be used by many as a high‑quality headphone amplifier, Mytek have included a “reference high‑current, high‑transient headphone amp” capable of supplying up to 3W (and 300mA) of power into headphones of any impedance, including very low‑impedance designs. I tested the Liberty’s headphone amp with a wide variety of headphones, including Sony MDR7509s, AKG K701s and K812s, Sennheiser HD650 and HD25s, and in‑ear IE800s. The performance was flawless with them all: there was more than enough volume for all of the headphones I used, and the sound quality was excellent, with powerful bass, airy open high end, precise mid‑range details and inky‑black backgrounds. 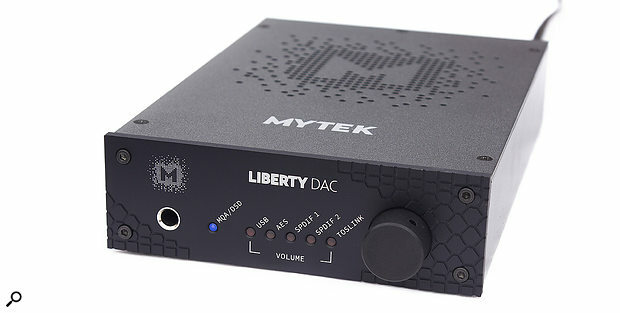 The Liberty’s ability to handle a wide range of different PCM and DSD signals and files, as well as being amongst the few converters able to handle the new MQA format, certainly gives it an advantage amongst the competition. However, given its intended role in the hi‑fi market I’m surprised that Mytek haven’t either equipped it with a remote control as standard, or offered one as an optional extra. That would not only enhance the user experience, but would also help it compete against the likes of RME’s ADI‑2 DAC. Overall, though, despite some unexpected bench test results, the Liberty is an excellent converter, and its compact size and connection versatility make it an attractive option for anyone who needs a high‑quality and easily portable reference‑grade converter and headphone amp. The most obvious alternative is the RME ADI‑2 DAC, which is a close match on price but includes a remote control and has the ability to serve as a bi‑directional computer interface — though it currently lacks MQA compatibility. The Mytek Range: Not Just Converters! The American manufacturers Mytek Digital are best known for their range of A‑D and D‑A converters, with their D‑As in particular being equally popular in both the hi‑fi and professional audio markets. However, the company also manufacture a range of other pro‑audio equipment, including a power amplifier, a word‑clock generator, a sample‑rate converter, a couple of A‑D converters, and a 12‑channel live‑room headphone monitoring system. 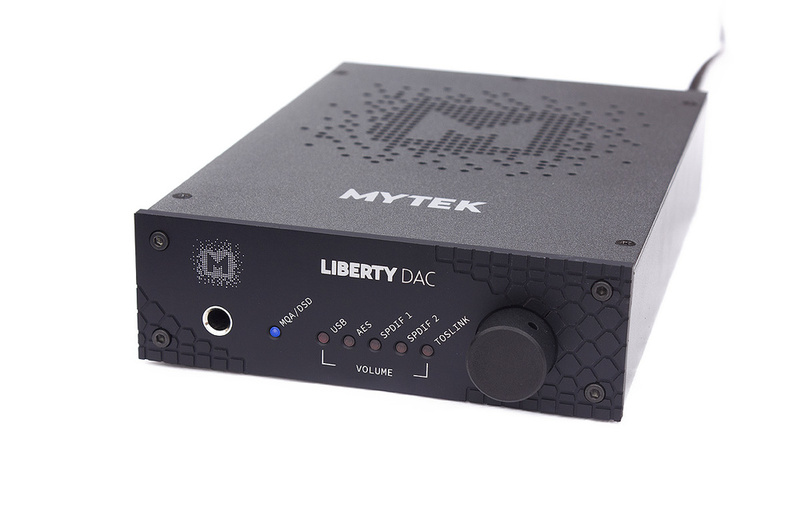 The Liberty is one of a relatively small number of converters that incorporate decoding facilities for the MQA — Master Quality Authenticated — format. I described the new MQA approach in considerable depth in the SOS August 2016 issue, but the short version is that it is a data reduction system which reduces a 24‑bit/192kHz ‘high‑resolution’ digital signal into the space of a 24‑bit/44.1kHz file, while also retaining compatibility with that format. This means that any WAV file player can replay an MQA file, but an MQA‑compatible converter can ‘unpack’ the file to regain the additional information and higher sample rate of the high‑res source. The format also claims audible advantages in terms of greatly reduced temporal smearing, and an embedded signature code which is used to authenticate the file as being the genuine article approved by the label/artist, rather than an up‑sampled fake. The MQA format is slowly gaining ground in both hi‑fi and professional circles, so it’s a future‑proofing advantage that the Liberty can handle MQA files already. High-quality conversion and a powerful headphone amplifier. Compact and elegant design with versatile connectivity. Configurable over USB via a software app. DSD playback and MQA decoding. Technical performance falls slightly short of some direct competitors. This compact, high-quality USB D-A converter boasts a powerful integrated headphone amplifier and the ability to handle a wide range of PCM and DSD formats, as well as supporting the MQA system.